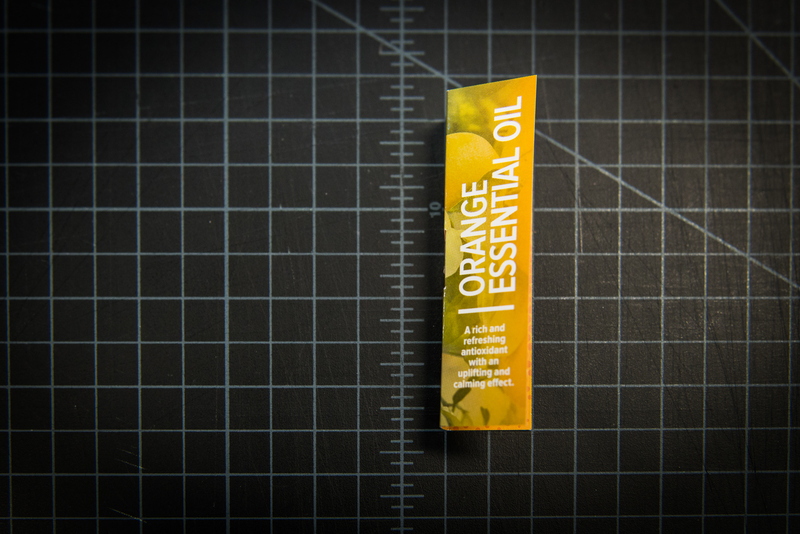 These orange essential oil cards serve as a memorable calling card for potential hires to take away that would create a lasting impression and a reminder to follow up with Adventist Health System's human resources talent acquisition team. 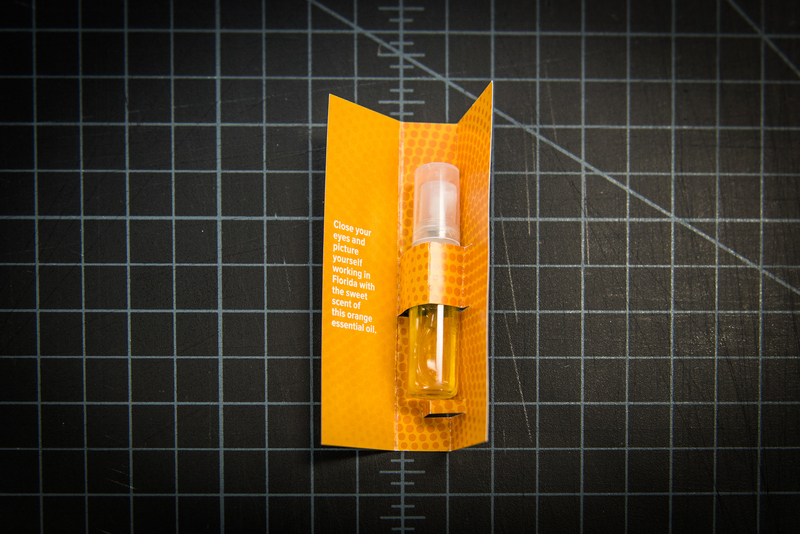 These custom fit orange essential oil cards are one of the most recent booth giveaways from our growing human resources talent acquisition team. The goal was to develop a memorable calling card for potential hires to take away that would create a lasting impression and a reason to follow up with Adventist Health System as a potential employer. 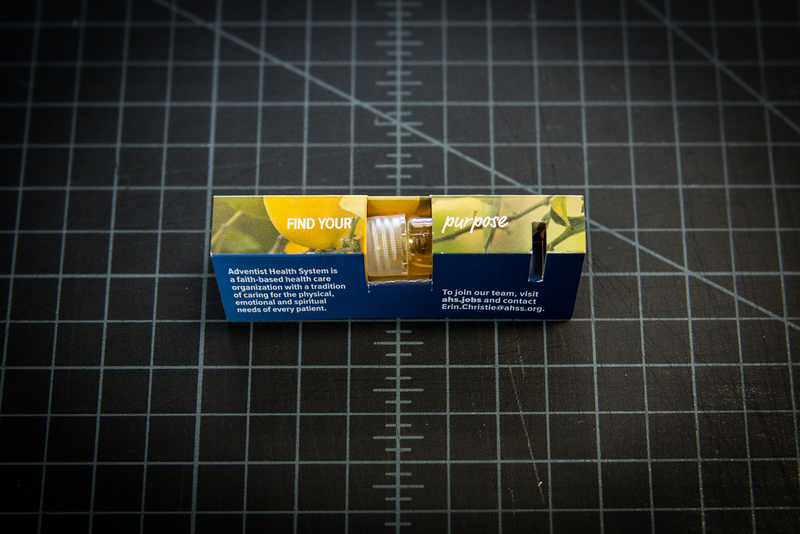 These essential oil cards needed to be flexible enough to fit two different sizes of oil vials—one tall spray vial and one short screw-top vial. The original request from the client was for a swing tag that would tie on to the neck of each bottle. The hours of manual labor our print vendor had quoted was untenable, so I countered with the idea of channeling a scent sample folder. After a couple of iterations, some tweaking and testing I created a final design that was able to snuggly support both vials and also required less manual set-up effort. The essential oil cards also needed to fit in with the current recruiting branch of our visual brand expression. This friendly yet simple expression emphasizes the blue gradient accented with orange, and the tagline: "Find your purpose and your passion". The card's audience is very widely varied. In this version they were distributed at an out-of-state job fair, recruiting for jobs in Florida facilities. The Orange oil and orange grove imagery are a call to Florida elements of heritage—sun and citrus. The cards hopefully served memorably and effectively as our recruiting team's long-distance calling card. The talent acquisition and the creative services teams chose essential oil as a giveaway as a nod to Adventist Health System's commitment to whole-person health and proactive wellness.